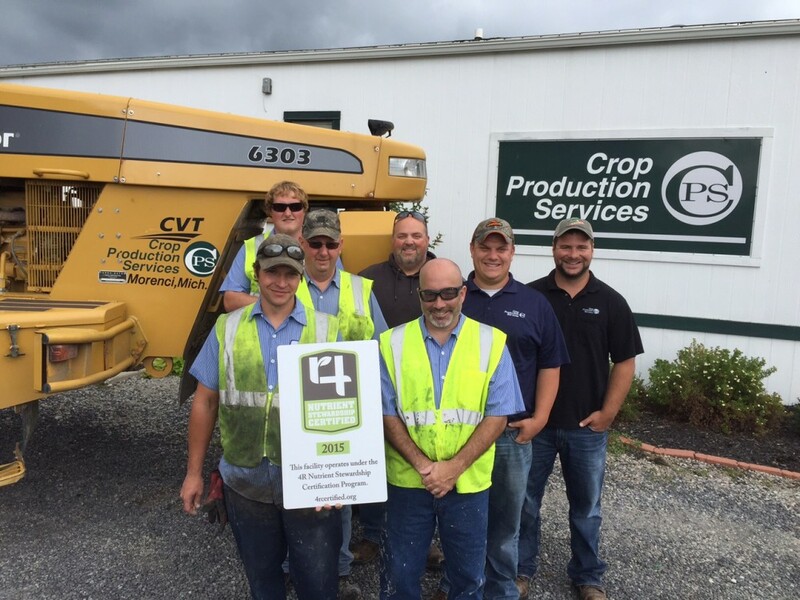 The 4R Nutrient Stewardship Certification Program has announced that Crop Production Services, Inc.’s facility located in Morenci, Michigan has been added to its growing list of nutrient service providers to achieve certified status. The entity is the first in Michigan to be recognized by the voluntary certification program – a concentrated effort by the agriculture industry to improve nutrient use efficiency and reduce nutrient loss in response to excessive levels of nutrients being cited as a contributing factor to harmful algal blooms in Lake Erie. CPS Morenci has two certified crop advisers on staff, four full-time crop consultants and an operations supervisor who handles all precision agriculture duties for the branch. The facility services 70,000 acres of farmland in the Western Lake Erie Basin and an additional 5,000 acres outside the basin. The Morenci branch is Crop Production Services’ second facility to become certified through the program. “By using technologies such as soil mapping, zone sample of soil data and applying nutrient using variable rate technology, we are helping our growers get their nutrients only where they are needed, and avoiding areas where they are adequately available in the soil,” said Operations Supervisor Caleb Fox. Nearly 1.2 million acres and approximately 3,150 farm clients are serviced by the 17 facilities in Ohio and Michigan that have earned 4R Nutrient Stewardship Certification, with approximately 60 percent of those acres being in the Western Lake Erie Basin. “CPS Morenci’s employees worked very hard to ensure that its operations were following the 4R’s, and we congratulate them for their stewardship practices and success,” said Andrew Allman, executive director of the Nutrient Stewardship Council. MEDIA: Download a high-resolution photo of the CPS Morenci facility receiving its 4R certification sign. PHOTO CUTLINE: Crop Production Services’ Morenci, Michigan branch is now 4R Nutrient Stewardship Certified. Employees pictured (from left to right): Front Row: Paul Davis and Roger Reiniche; Middle Row: John Borer and Caleb Fox; Back Row: Erik Hilton, Todd Studenka and Travis Ault.